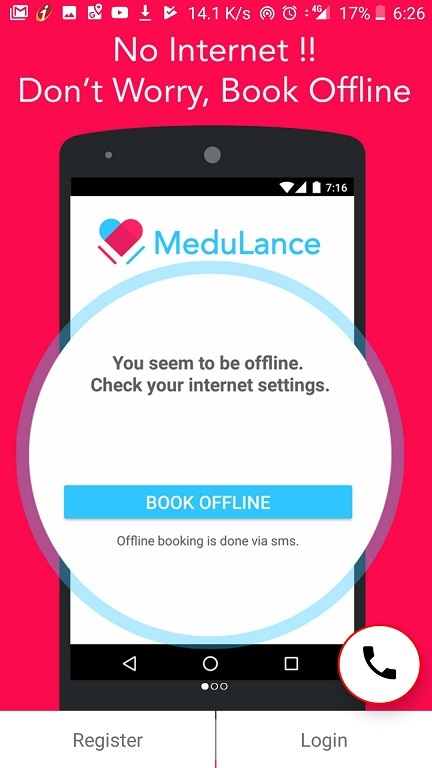 Medulance did well in our case both usage and service wise although the response to the booking confirmation appears a bit late if you are in an emergency. Might be it due to the location or availability of the ambulance near to you. However, if you have someone around you in trouble & need an ambulance you can surely use this app to get the medical help instantly. For traveling you can book a cab then why not the Ambulance in an emergency? 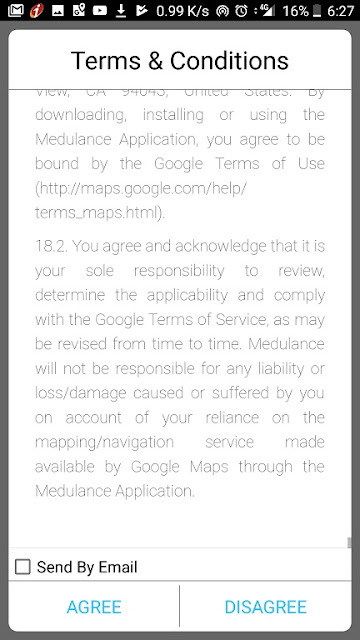 If you live in the Delhi/NCR region then beside the Ola and Uber apps in your smartphone one more app should be there called Medulance. 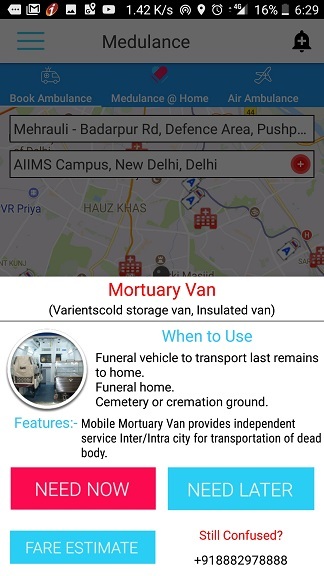 It is a smartphone ambulance app available for both Android and iOS users and allows to book various types of ambulances on the go. Ap per the Medulance, they provide 60+ hygienic ambulances over their platform for faster and timely medical attention. 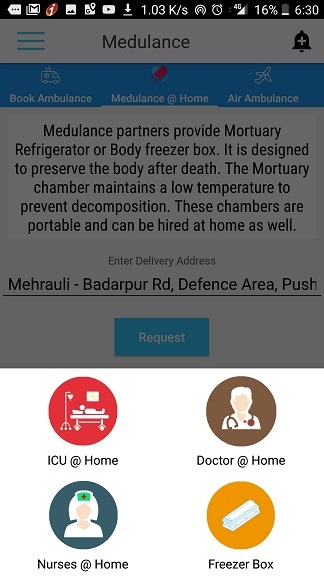 Apart from an app, they have also a web portal to book the Ambulance. The services of this app so far are only available for Delhi/NCR peoples. 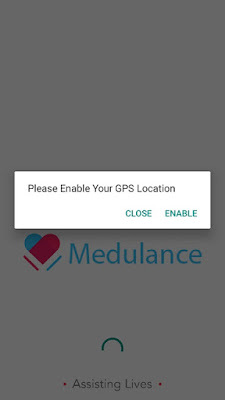 Like Ola and Uber, the Medulance is also working on GPS in order to track the user destination and provide the cab as soon as possible. 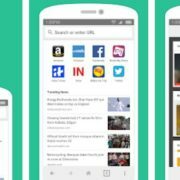 Here in this article, we will take you through the interface and features of this app. Go to your respective app store and search for Medulance or use these links: Android and iOS. 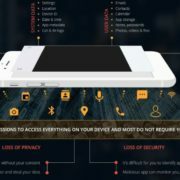 Step 1: After installing the app, it will ask for certain permissions including the location. Step 2: The second step is to register the app. 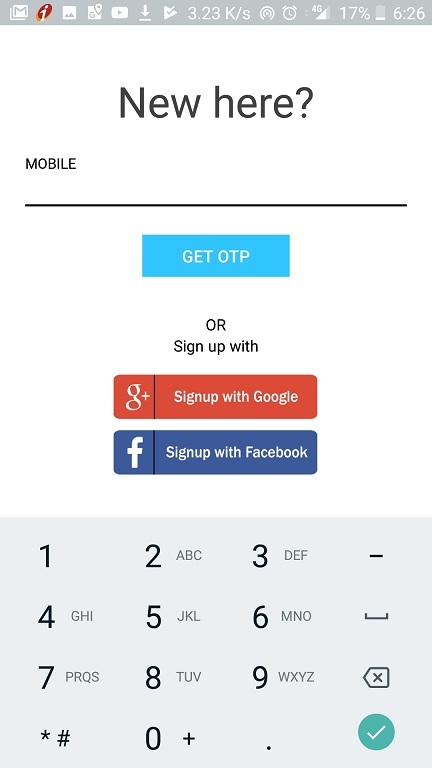 Use your number to get an OTP and register instantly. 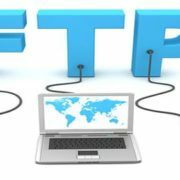 You can also use the Google and Facebook. Step 3: Here, we are using the phone number to register the app. 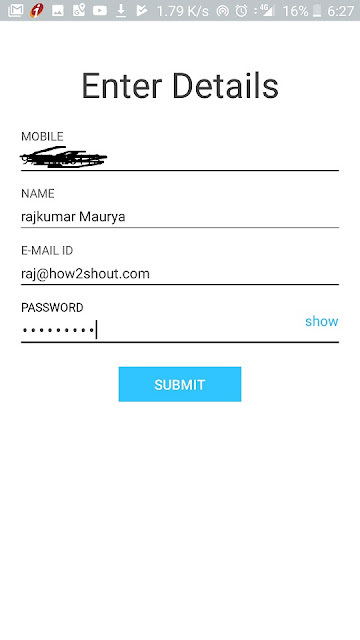 Once the registration is done, you need to enter your details as shown in the screenshot. Step 4: Accept the term and conditions. Please read them before tapping on Agree. The app interface is very easy to understand just like OLA and Uber. On the left top side, you will find a hamburger icon with all the options offered by this app. Book an Ambulance: This option is used to book ambulance available near to your location. Bookings: Shows all your successful bookings. Emergency contacts: A user can add up to 5 contacts into the app in case of an emergency your loved ones know about you. Medical History: This option has several pre-listed disease/medical conditions. 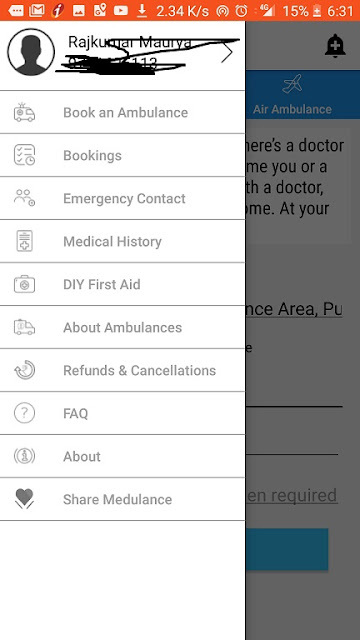 In case you are suffering from any medical condition listed in the app you can select them which helps the doctor and ambulance operator. You can also feed your blood type. 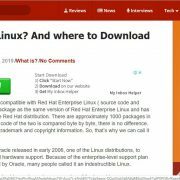 DIY First Aid: It provides few quick first aid tips. 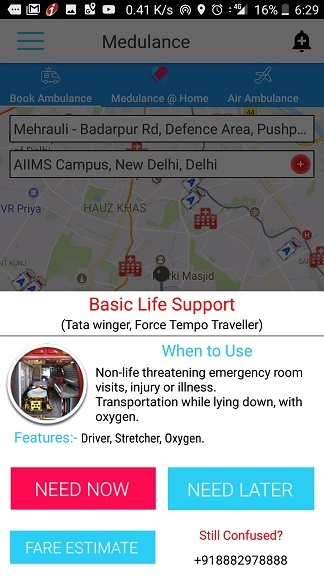 We used this app to book an Ambulance and it is pretty much easy just like booking a cab from the smartphone. 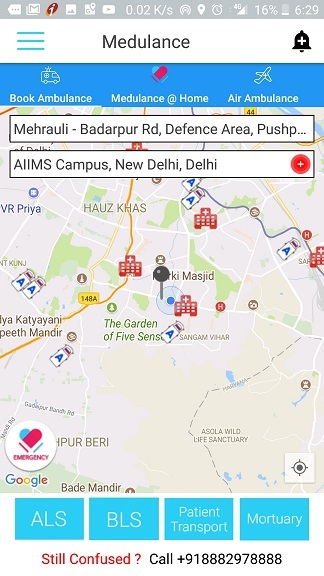 Step 2: You will get a Map interface that also shows how many ambulances available near to you. Either using the Pin over the Map or box you can define your location in case your GPS is not able to grab your precise location. Now just under the location address box, you will find the destination search box, just enter your destination and select the type of Ambulance you want. The Medulance offers four types of Ambulance those are: ALS, BLS, Patient Transport and Mortuary. The First ambulance type is ALS which meant to use in critical situations such as emergency room visit, severe injury, heart attack or unconsciousness. It features Doctor, Paramedic, Stretcher, Oxygen, ventilator, Patient motoring equipment, and Defribilator. No-life threatening emergency room visits, injury or illness. It provides the transportation while lying down with oxygen. It featured Driver, stretcher, and Oxygen. Patient Transport ambulance is the most basic type of transport available to patients requiring ambulatory support for their healthcare appoints, for admission to and discharge from the hospital, inability to travel in a normal seated position, impaired cognitive function or lack of independent movement. It features driver, stretcher, and oxygen. You can understand by its name. It helps in the transportation of a deceased patient from one place to another. Before booking any of these ambulances you can check the fare estimate from your location by using the option called “FARE ESTIMATE”. The other two main features about to discuss in this app are Medulance Home and Air ambulance. 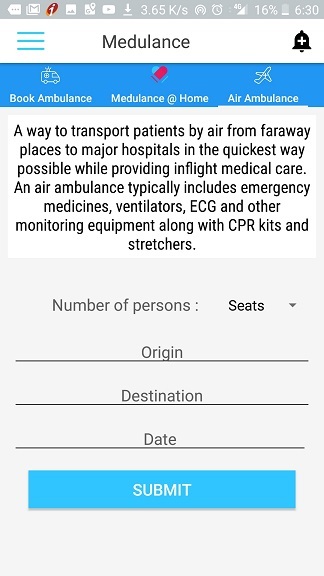 To take the patient to some faraway places by air while providing in-flight medical care user can use the Air ambulance option. An air ambulance typically includes emergency medicines, ventilators, ECG and other monitoring equipment along with CPR kits and stretchers. 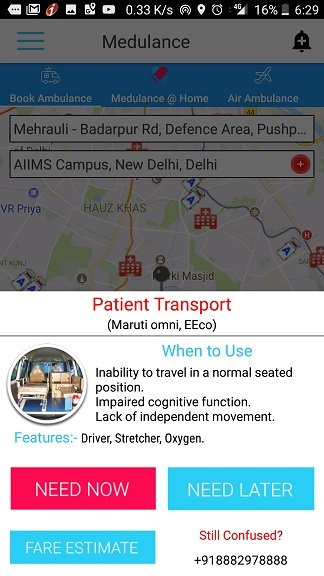 Once a person book the ambulance through the Medulance app and after being confirmed, the patient will receive the ambulance transportation facility immediately but the time it took to reach the destination all depends on the location and traffic especially in Delhi like cities. So, overall this app did well in our case both usage and service wise although the response to the booking confirmation appears a bit late if you are in an emergency. Might be it due to the location or availability of the ambulance near to you. However, if you have someone around you in trouble & need an ambulance, you can use this app to get the medical help instantly.